We looked for at least 2,000 pounds of capacity to carry people, pets and gear. The second biggest consideration for us was the floor plan. Many RV’s are designed for weekenders. What we wanted, though, was an apartment on wheels. We wanted a motor home where we’d be comfortable living day in and day out. We wanted a TV that we could see without straining our necks. We wanted a bed that didn’t require climbing over one another to get in or out. We wanted a full bathroom. We wanted a bedroom separate from the main living space. We wanted a decent kitchen. And we wanted a dining room table with free standing chairs. Were all of these things absolutely necessary? No. But we found them in Winnebago’s Sightseer 33C. Motor home or 5th wheel? If we had to do it over again, we’d be extremely tempted to get a 5th wheel. We love our motor home. It is absolute perfect for us in almost every way imaginable. But trailers have one major advantage over motor homes, and it is huge: no engine or drive-train. Bringing your entire house to the shop for oil changes or major maintenance is a royal pain. This alone might be reason enough to favor a 5th wheel. So why did we get a motor home? It was the path of least resistance, really. If we bought a 5th wheel, we’d also have to research and buy a heavy duty truck. That was just one more thing added to an already very long to-do list. I also assumed (correctly I think) that this noob would have a far easier time learning to drive a motor home. I had towed small trailers in my youth, and I knew that backing them into spots required considerable skill and practice. I had neither. We didn’t want to use a heavy duty truck for all of our sightseeing and errands the way most 5th wheel owners do either. And we didn’t like the idea of transporting our anxious cats from the 5th wheel to the tow vehicle every time we traveled. Letting them ride in the home that they were used to was the better solution for them. Some people also say that set-up and take-down takes longer with a 5th wheel, but I’m not convinced. I think it probably takes us about as much time to hook up our tow vehicle as it does for an experienced 5th wheel owner to hook up their truck. So I think that issue is probably a push. The limited cargo carrying capacity of the smaller RVs we considered eventually lead us toward a Class A. We originally thought we’d get a mid-sized Class C, but couldn’t find one that had everything we wanted. What you choose here is really just a matter of taste, though. Folks have successfully full-timed in everything from a ’58 Volkswagen van to a 44 foot Class A bus. If I were traveling alone, I think I could make a small Volkswagen or Class B work just fine. But with us traveling together, we really value having some individual space. Diesel owners extol their virtues: better hill climbing, smoother rides, longer lasting engines, and more storage space. But at nearly double the cost, these advantages seemed to us like extravagant luxuries. Even if I had unlimited funds, the miser in me could never justify diesel’s price tag. We thought long and hard about whether to take a car along with us. We’re so glad we did. We put three times as many miles on our car as we do on our motor home. Bringing a car means not having to unlevel, unhook and secure all belongings every time we want to run an errand or see a sight. I have a feeling we wouldn’t get out nearly as much as we do if we didn’t own a car, which kind of defeats the whole purpose. It’s one expense we feel is absolutely worth the price. Great review…..can you give us some of your driving learning curve stories? The one time we thought to use an RV we didn;t because we had heard how hard they are to maneuver. I’m planning a post on that very topic so stay tuned. Great info since I am in the research stage on what to buy. I appreciate your thoughts. Excellent reasoning article! We have a 30′ Sightseer which we are enjoying very much as a part-time vehicle. Comparing your 33′ with the 30′ – the additional 3′ makes an incredible difference in the walk around space in the bedroom. I wish we had the additional 3′. Clothing storage and making the bed would be a lot easier. I don’t know if we saw the Sightseer 30. The 33c was a new floor plan the year we got it and we thought it was heads and shoulders above anything else we had seen. We’re very happy with it. Thanks very much for your well thought-out thoughts. great blog and thanks for your information! !…we are still working and have a couple more years to go before we make the big purchase!..the rv you bought has a nice layout!!.. Thanks. What we like about it is that it doesn’t feel like we’re living in a camper. It is more like a one-bedroom apartment on wheels. Now that’s a brave thing to do for sure, I am just a bit envious. I also enjoyed reading your blog, well written clear and concise in your research…. I think its important to take risks in life and do things that scare you. Having said that, chasing your dream life isn’t all that scary once you realize that there are few decisions that can’t be undone. We have been reluctant to purchase an RV until we found one that had a king bed, good kitchen, free standing dinette table and complete enclosed bathroom. Not sure what year your 33c is, but 2010 was the first year for this new floor plan. When we saw it, we thought we had died and gone to heaven. The bad part is that we really didn’t want to buy new. Well, it is now 2012 and finding a used 2010 33c is proving to be almost impossible. Obviously, nobody wants to get rid of theirs! So we are looking at a new 2011, but it doesn’t have full body paint, or the 22.5 wheels that the 2012 has. Any thoughts? If you wait two more years you can probably buy ours . . . lightly used. LOL. Great post! 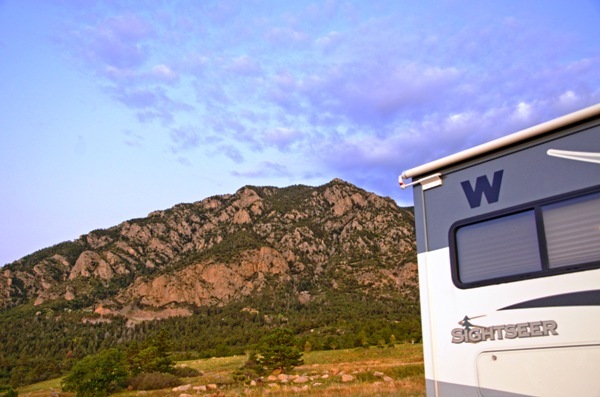 I have the Winnebago Sightseer 29R and LOVE IT! The layout is terrific! We’re very happy with ours. One more argument for gas vs. diesel…freedom. You are really limited regarding places that sell diesel, and often must stick to interstates. Gas is sold everywhere. Thanks for this useful article – we are also wanting to RV full time – 40s couple plus our 55 lb dog. We love the Sightseer floorplan the most so far of all we have seen. Our biggest concern is fuel economy – can you share what you average with and/or without a TOAD (we plan to tow a Mini Cooper). Thank you so much!